SACRAMENTO, Calif. (CN) – With a $2.7 billion voter-approved bankroll ready to be spent on new dams and water projects, a California state agency is being accused of sitting on the funds. The California Water Commission, tasked with dispersing Proposition 1 funds, faces a tidal wave of criticism and skepticism after its staff concluded earlier this month that no water projects proposed so far passed initial cost-benefit muster. The announcement roiled the water and farming districts vying for the state bonds, along with elected officials who helped craft the 2014 proposition. Lawmakers on Wednesday asked the commission to release the funds earmarked for new water projects, urging expediency as California slogs through another unseasonably warm and dry winter. A bipartisan mix of lawmakers lined up to address the commission at its monthly hearing in Sacramento, the first since staff released failing initial “public benefit scores” for 11 water projects. Proposals range from new groundwater banks, existing reservoir expansions and multibillion-dollar new dam projects. Proponents say the projects will add valuable water storage without damaging the environment. Passed overwhelmingly by voters at the height of California’s most recent drought, Proposition 1 appropriated $2.7 billion for new lakes and water storage. The measure, which did not earmark funding for any specific project, requires the commission to grade applications on overall public benefit, relative environmental value, resiliency and implementation risk. Commissioners assured the crowd that the unfavorable initial round of cost-benefit ratio scores is just the first step in the process and that none of the projects have been summarily denied. Armando Quintero, chair of the eight-member body, pushed back on the notion that the commission is being stingy with the bonds. He says the 70-member review staff in most cases needed more information about the projects and that applicants can appeal the initial scores. A final decision is expected in July. “Believe me, this commission is anxious to get the money out the door and get projects funded,” Quintero said. The two biggest projects have gained support from nearby cities, water districts and lawmakers. Temperance Flat Dam east of Fresno would add 1.26 million acre-feet of water storage – and flood miles of canyons and Native American heritage sites along the San Joaquin River. It would be the second-tallest dam in California with an estimated $2.6 billion price tag, and be operated by the U.S. Bureau of Reclamation. Proponents want the state to pony up $1.3 billion in state bonds to spur construction. The water commission gave the project among the worst grades of the 11 projects vying for state funding. The competing Sites Project would be built more than 250 miles north in Colusa County, in the foothills of the California Coast Ranges north of Sacramento. It would added 1.8 million acre-feet to California’s water system. Sites is considered an “off-stream” project with most of its water piped in from the nearby Sacramento River. Backers want $1.7 billion of the project’s $5.1 billion cost to be picked up by taxpayers. While environmental groups campaigned for Proposition 1 in 2014, many haven’t jumped on board with Sites or Temperance Flat. 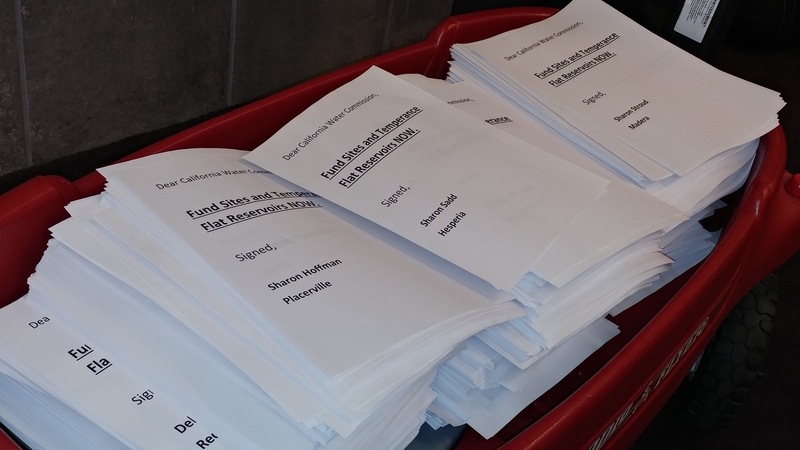 Assembly Republican Leader Brian Dahle presented the commission with a red wagon full of 4,000 petitions in support of the two major proposals. He urged commissioners to act swiftly going forward. “Farmers like myself, all through the state, are concerned about the shortage of water – we’re seeing another drought cycle,” Dahle said. Dahle’s plea comes on the heels of more bad news for Central Valley farmers: federal regulators said Monday they will only receive 20 percent of their initial water allocation because of the state’s dismal snowpack.